The power of “real” people in marketing is certainly not new. The latest iteration of the idea is peer-to-peer marketing in social media. The underlying notion is simple, whether it is social media or a traditional “testimonial” commercial, consumers are more likely to trust the opinion or experience of people that they perceive to be like them…real and therefore trustworthy. 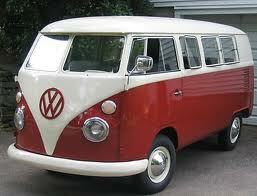 So a reincarnation of the iconic VW Bus is inherently exciting and interesting to many Americans. 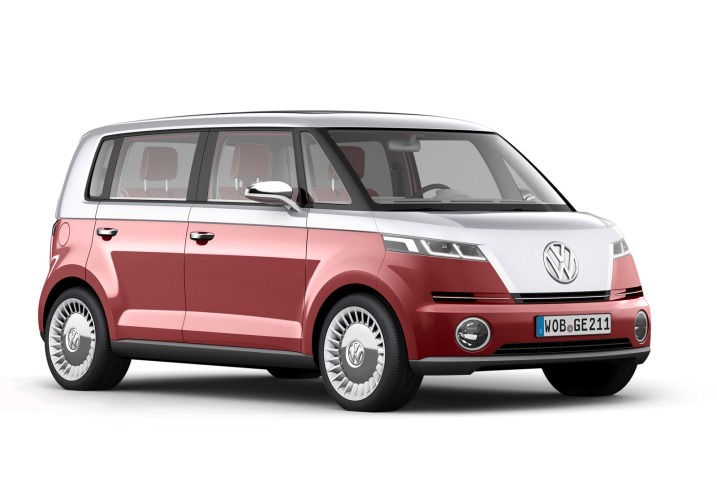 The Bulli concept seems to be creating the kind of interest in Geneva that has everyone hoping that VW will decide to put it into production. Mercedes-Benz scores with (a) safety but not in the Super Bowl. In USA Today’s Ad Meter, this commercial finished in the top third at 19th. Of automotive commercials in the Super Bowl it was ranked 4th of 18. Not a bad showing for the brand but it certainly isn’t getting talked about the way Chrysler’s “Imported from Detroit” spot or VW’s “The Force” commercial is. I must admit, I felt a little let down. The Super Bowl is such a huge platform and it demands that you have something important to say and that you do it in a different way. Chrysler understood this and is reaping the benefits. Mercedes-Benz basically said that they have been building cars for 125 years and the newest ones are now available. Really? Puff Daddy was enough to get noticed and for the car wonks among us there were lots of wonderful old MBs in the ad but that’s the best they good do with $6MM in airtime on the Super Bowl? I’m sure the Super Bowl commercial reflects the push and pull of all the various constituents. The agency folks want the message to be simple and easily understood, the company marketing people want it to be differentiating (125 years) and the dealers want to see product. Check, check and check. 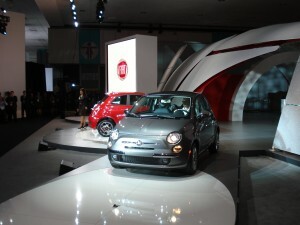 Is Fiat taking VW’s US positioning? VW is intent on becoming the world’s largest auto manufacturer. To achieve this lofty goal, the company needs to sell a whole lot more in the United States. 800, 000 is a heck of a lot of cars for VW. 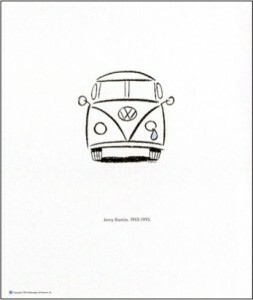 Especially considering that VW’s biggest volume year in recent memory was 2001, when it sold 355,648 units (in the 1970’s VW did sell roughly 500,000 units). Many industry experts have questioned the wisdom and even the possibility that VW might sell 800,000 units in the US. Volume is the holy grail of the auto industry…but should it be? The case for stronger brands. GM may have been the leader for 76 years, but we all know how that worked out. The quest to be the global leader in sales drove Toyota to the breaking point where it lost its legendary focus on quality and reliability. The result? The biggest series of product recalls in history, allegations of unintended acceleration, thousands of lawsuits, and a decline in brand perception that will take years to recover. Now Volkswagen has set its sights on the global sales crown and some are questioning the wisdom of the company’s leadership. You can’t spend much time working in or around the automobile industry without feeling the relentless pressure of needing to sell more. The problem that auto manufacturers face is that their business has extremely high fixed costs. Unlike “variable” costs that go up and down based on the amount of vehicles produced, fixed costs remain the same regardless of volume. Fixed costs include all the developmental investments, labor expenses and the costs of the factories themselves. With such high fixed costs, the more vehicles the manufacturer can produce, the lower the cost per unit and the better the margin. In short, higher volumes equal higher profits. So bigger is better? Maybe. Today, Interbrand released their “Best Global Brands 2010” ranking. 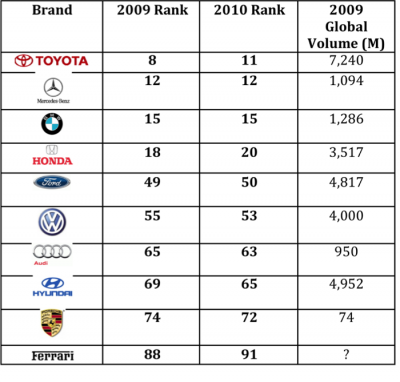 Ten automotive brands made the top 100. 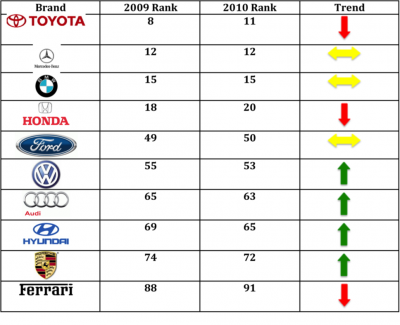 The following chart details the ten automotive brands, their ranking in 2009 and where they stand in 2010.